Zen Villa is a luxury farmhouse that is nestled amidst lush greenery, with 5 bedrooms that can house a total of 17 people. The tariff per night is INR 40,000 for 12 people, which is inclusive of taxes. 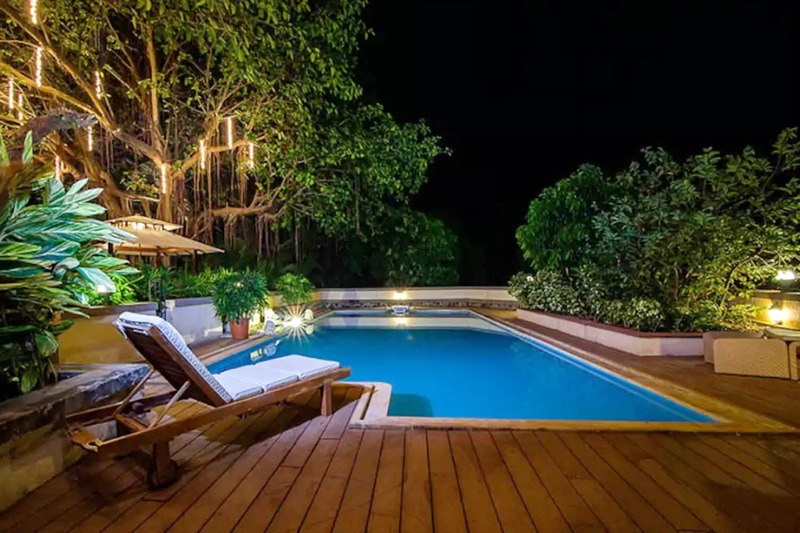 It’s the perfect place for those of you who want to host events, with lush lawns (there’s a gazebo too) a majestic entrance way, a gorgeous pool and two pool-facing rooms. It’s your chance to escape the city blues with a big group and enjoy the summer. The villa is ultra-modern, luxurious and has beautiful interiors. Not just that, the lawns are beautifully maintained and there is enough space for a large group, so it’s the perfect location for a special day you’ve had in mind. The bedrooms and baths are spacious, and there’s even a dedicated area to play badminton. It also has a fully-equipped kitchen, and there’s also provision for a full-time cook that they provide at a nominal cost. There are so many pretty nooks in the villa where you can catch up on your favourite book or just laze around under the stars. Located in Zirad village, you can take a boat to Mandwa jetty and then reach the property in 15 minutes. All the beaches are close to the villa, so you’re sure to have a magical time here. If you’re on the lookout for a luxurious weekend getaway or want to just take it easy with a large group of friends, this is where you should be.